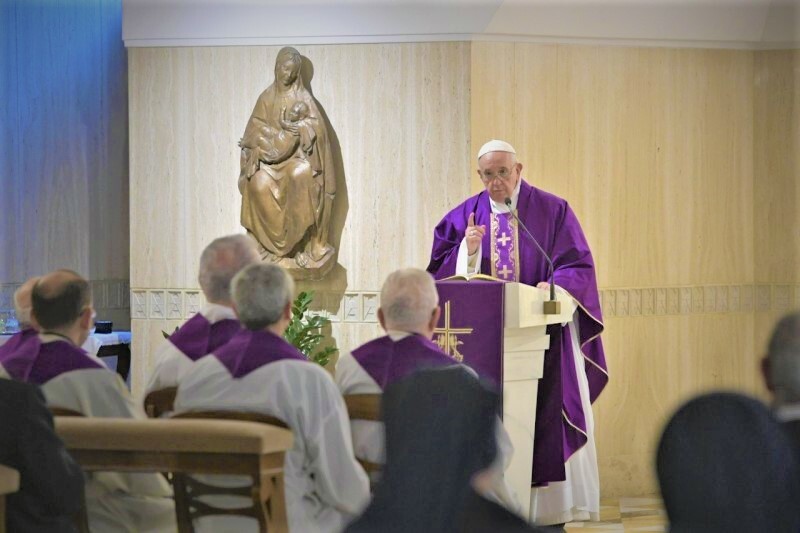 During the Mass celebrated in the chapel of the Casa Santa Marta, the Pope speaks about the mercy of God and offers some suggestions for living the time of Lent to its fullness. The mercy of God is such a great thing, very great. We must not forget this. How many people [say]: “I have done such terrible things. I have purchased my place in hell, I can’t turn back”. But do they think about the mercy of God? Let us remember that story about the poor widow lady who went to confess to the Curé of Ars. Her husband had committed suicide; he jumped from the bridge into the river. And she wept. She said, “But I am a sinner, a poor woman. But my poor husband! He is in hell. He committed suicide, and suicide is a mortal sin. He is in hell”. And the Curé of Ars said, “But wait a moment, ma’am, because between the bridge and the river, there is the mercy of God”. But to the very end, to the very end, there is the mercy of God. Also, it is a habit that gets mixed up in our life even without us realizing it. Always! Even by beginning a conversation: “Did you see what he did?” Judgement of others. Let us think about how many times each day we judge. All of us. But always through beginning a conversation, a comment about someone else: “But look, that person had plastic surgery! They’re uglier than before”. The Lord teaches us: “Give and it will be given to you”: be generous in giving. Don’t be “closed pockets”; be generous in giving to the poor, to those who are in need, and also in giving many things: in giving counsel, in giving a smile to people, in smiling. “Give and it will be given to you. And it will be given to you in good measure, flowing over, pressed down, running over”, because the Lord will be generous: We give one, and He gives us one hundred of all that we have given. And this is the attitude that … The importance of giving alms, but not only material alms, but spiritual alms too: spending time with someone in need, visiting someone who is sick, offering a smile.